Sadie Appleby has lived all her life in her small village. One night she is rudely awoken by her older and bolder sister, Ella, who has robbed her employer and is on the run. The girls flee their rural home of Westmorland to head for London, hoping to lose themselves in the teeming city. But the dead man's relatives are in hot pursuit, and soon a game of cat and mouse begins. Ella becomes obsessed with the glitter and glamour of city life and sets her sights on the flamboyant man-about-town, Jay Whitgift. But nothing is what it seems - even Jay Whitgift. Can Sadie survive a fugitive's life in the big city? But even more pressing, can she survive life with her older sister Ella? The Gilded Lily is an atmospheric historical novel, filled with vivid descriptions and characters who come to life. Yet, while I enjoyed the beauty of the writing as a whole, there were some elements of the novel which hampered my enjoyment. Firstly, I felt The Gilded Lily developed slowly in places, and I purposefully read through some parts quickly. Secondly was Ella, one of the main characters, who at times I hated so much that I wanted to slap her! Although, this does show that Swift has created a strong, realistic character who can provide intriguing conflict. Keeping that in mind, there were, in addition, characters whom I loved. These included Ella's caring sister, Sadie, and their acquaintance, Dennis. I adored reading of the developing friendship between Sadie and Dennis; their meetings were certainly one of the reasons why I decided to keep reading. 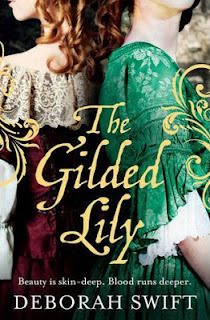 Overall, The Gilded Lily is skillfully written with striking descriptions and characters capable of summoning a wide range of emotions. If you enjoy a historical novel with a relaxed pace and an unpredictable ending, this could be for you.